And NOW I'm including all of my great knowledge on hitting for FREE! For a Limited time you get my Rotational vs. Linear Hitting DVD with your order, Don't Wait, order TODAY! 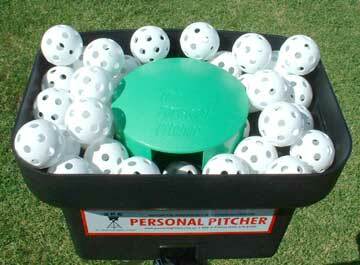 The machine is a device that pitches golf ball sized whiffle balls. The theory behind it is that if you can hit a 3" golfball you can certainly hit a 9" baseball and for sure hit a 12" softball. To make you the best hitter possible, I'm including what is called the Gro-Bat. It's a bat that is made to the exact length and weight of your real bat, but it is only 1" in diameter and it has a foam sleeve right where the sweet spot should be. It's like having your own pitching machine in your own backyard (or basement or garage) for a lot less money, it's much safer and it forces you to concentrate even more. It holds 100 balls at a time, so it doesn't need a second person to feed the balls and comes with both an electrical cord and a rechargeble battery, so you could take it to the field with your team. See Albert Pujols use his Personal Pitcher in his own back yard here. (It's toward the end of the video). But, I only have one version that I recommend and you can't find it cheaper anywhere else on the web. And until Dec. 8th, no one is offering a great hitting video with this machine/bat combination. The reason I recommend the Pro unit is because it lasts twice as long, throws more consistently and has 3 speeds (simulating speeds from 40 - 90 mph) as well as curve balls. 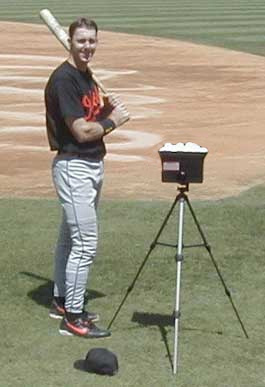 Again, I've included the Gro-bat to really get the maximum out of this combination pitching machine & training tool. It comes with the Pro unit, the Gro-Bat (in the size and weight of your game bat), a tri-pod to mount it on, and even free batting gloves. And don't forget, by ordering on this page before Dec. 8th, you get the free DVD, selling for $40 on one of my other pages. I know you'd expect to pay something similar to a full batting machine but it's less than 1/3 the price, only $263 plus $18 S/H. (CA residents add $19.07 tax). Choose your batting gloves and your Gro-bat sizes and click on the Buy Now button, for your free DVD, batting machine, 1" gro-bat, tripod, and batting gloves.